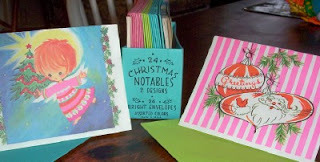 Forget standing in line for returns, the day after Christmas means writing thank you notes! I found this darling vintage stationery for a quarter at a chilly December yard sale. I thought these would be sweet thank you's from Elise and Andrew. Which brings me to the new question of Internet etiquette: is it permissible to send thanks via email alone? It would save so much postage. I've taken photos of the children with their gifts and emailed them--along with other Christmas pictures and a note about our morning--to faraway family. This helps everyone feel in touch on the big day. I guess I will have Andrew write his own notes so the paper versions aren't duplicates of my emails. The funny thing is that while I get the strangest assortment of gifts from out-of-town family, I never receive the one thing they KNOW I use--stationery! I'll vote yes on internet thank yous. What would be the argument against them? Thanked in person, on the phone, in sign language, in writing on paper, or in writing on line - thanks is thanks. I don't agree. I have people who 'keep score' on things like that: for them, a handwritten note is mandatory. Also, it gets the kids in the habit in the days when their 'thank you notes' are just scribbly drawings. My vote is to consider the recipient when making the decision: Gen X aunt or uncle may prefer the email rather than paper to recycle; grandmother may prefer the paper to touch, feel and save. This year I am going to use Shutterfly to select a picture and a border (prepaid 4x6 prints for 12 cents each) for each thank you, then write on the back of each, or maybe glue to a piece of cardstock or construction paper, depending on what I find in the art drawer. I'm with Alison -- there are some people who I know would appreciate a written thank you note, and those who would prefer an emailed one (and there are sites where you can create a free ecard).